Harley Quinn is tired of being the villain of Batman and the member of Suicide Squad. She wants to be a girl and become a princess so she can not have better help than the Disney girls. Elsa, Cinderella, Bella, Vaiana, Mulán, Ariel, Rapunzel and Mérida have come together to help Harley and turn her into a fairy tale lady. What happens is that each princess has her style and they would never agree on how to dress our villain. That is why each one will choose a look for the girl, based on her own style and make her feel like an authentic Disney princess. Choose a different look for Harley Quinn according to the princess who is helping and get her more feminine and delicate side. 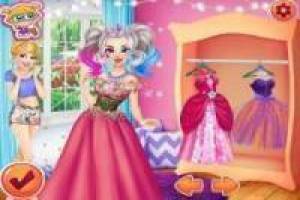 Enjoy the game Harley Quinn wants to be a princess, it's free, it's one of our Harley Quinn games we've selected.